Water, Glycerin, Ammonium Lauryl Sulfate, Polyethylene, Glyceryl Stearate, Lauryl Glucoside, Acrylates/C10-30 Alkyl Acrylate Crosspolymer, Caprylyl Glycol, Fragrance, Cetearyl Olivate, Sodium Hydroxide, Chlorphenesin, Sorbitan Olivate, Citric Acid, Tetrasodium EDTA, Caprylhydroxamic Acid, Butylene Glycol, Algae Extract, Artemisia Abrotanum Flower/Leaf/Stem Extract, Hydrolyzed Caesalpinia Spinosa Gum, Ganoderma Lucidum (Mushroom) Stem Extract, Lentinus Edodes Extract, Caesalpinia Spinosa Gum, Sodium Ascorbyl Phosphate. Mild Inexpensive Works quickly Can be irritating if over-used Confused as only for 'older' skin I am someone who has picked their skin for nearly 20 years. As a result I have scarring and discoloration on my face. I also spend a good deal of time in the sun, even with daily application of SPF, I still have sun damage from many years of tanning in my earlier years. I have found that many exfoliators are too abrasive and simply perpetuate my problems. When the skin becomes too stimulated it can overproduce oils, which in turn exacerbates the problems you are trying to control. I have been using this product for a few weeks and although I am often tempted to use it daily, I have found the best results from a twice weekly use. For me, it is best used in the shower, after my skin has been washed and is warm and soft from the shower. The other thing I've found to be an important step when using this exfoliator, is to allow my skin to rest for a few moments after rinsing, allowing the skin to air dry before I apply my moisturizer. If I was trying to increase my skin's moisture, I would apply my moisturizer while my skin was still partially damp, allowing more of the moisturizer to soak into my pores, but this is not my goal. 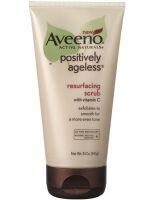 Another benefit of letting the skin air dry after using this scrub, is that it calms any sensitivity from the scrub removing some of the thinner layers of my skin, which if applied to early can cause minor stinging. Anyway, I have found this scrub to assist in keeping the dulling layers of dead skin from hanging around to cause further problems with pore clogging. It's mild, although if used to often, I think it could be irritating or cause more harm than good.